f.31 A village woman, boy and bullock standing in paddy felds with hills in the background. bl.uk > Online Gallery Home	> Online exhibitions	> Asia, Pacific and Africa Collections	> f.31 A village woman, boy and bullock standing in paddy felds with hills in the background. 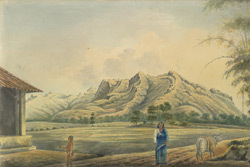 Watercolour drawing by John Johnson of a village woman, boy and bullock standing in paddy felds with hills in the background, from A sketch-book of 36 drawings (36 folios) depicting scenes chiefly in W. India and Mysore. c.1795-1801. In India traditional farming method are still used and farmers still make use of powerful animals, bullocks and water-buffalos, to plough paddy-fields before planting rice seeds. Dung or sewage is ploughed into the paddy fields as a fertiliser. Once planted the seeds require an enormous amount of water to grow and therefore paddy fields are flooded regularly. The harvesting takes place generally four months after the seedlings were planted. The fields are drained and the rice plants are cut using sickles and this is normally done by the farmer's wives.